George Harrison was known as the 'quiet Beatle' during his time with the Fab Four, but he became one of the most popular singer-songwriters in his own right. On what would have been his 75th year, here are some fascinating facts about the legendary musician. 1. George Harrison wife - who was George Harrison married to? 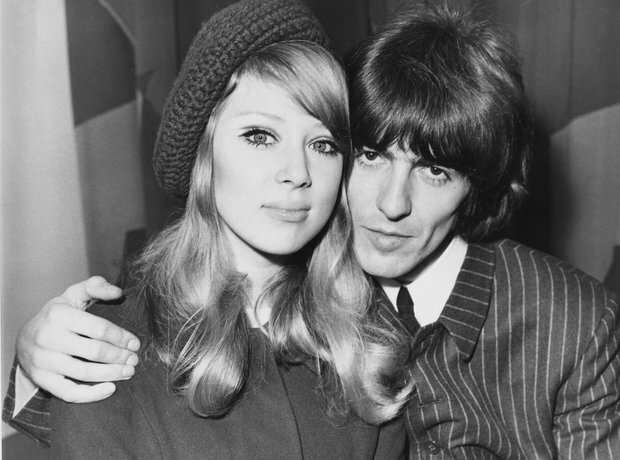 George married model Pattie Boyd in 1966, with Paul McCartney as best man. He and Boyd met in 1964 during the production of the film 'A Hard Day's Night', in which 19-year-old Boyd had been cast as a schoolgirl. They separated in 1974, with Boyd saying was largely due to George's many infidelities. One of which culminated in an affair with Ringo's wife Maureen. She later married Eric Clapton. George later married Dark Horse Records secretary Olivia Trinidad Arias in 1978. On 30 December 1999, he and his wife were attacked at their home by Michael Abram, a 36-year-old man. He broke in and attacked George with a kitchen knife, puncturing a lung and causing head injuries, before Olivia struck him with a fireplace poker and a lamp. Abram suffered from paranoid schizophrenia, and believed that George was an alien and that the Beatles were witches from Hell. George said: "[he] wasn't a burglar, and he certainly wasn't auditioning for the Traveling Wilburys." 3. George Harrison death - how did George Harrison die? In May 2001, George revealed he had undergone an operation to remove a cancerous growth from one of his lungs. In July, he was being treated for a brain tumour. On November 29, 2001, he died at a friend's home in Los Angeles, aged 58. Here, he is pictured with second wife Olivia. 4. George Harrison son - who is Dhani Harrison? George Harrison's only child is Dhani Harrison, whom he had with second wife Olivia in 1978. He is an artist in his own right, beginning with assisting in his father's final album, 'Brainwashed', and completing it with Jeff Lynne after his father's death in November 2001. He is also the founding member of the band Thenewno2. 5. How did George Harrison join The Beatles? George joined The Beatles with Paul McCartney and John Lennon when they were a skiffle group called the Quarrymen. Paul told John about his friend George, and in 1958, he auditioned for the band. Lennon felt George, having just turned 15, was too young. However, he later joined after socialising with the group and became accepted as a member. 6. George Harrison songs - What are his most famous hits? George became the first of the Beatles to score successful singles and albums as a solo artist, despite being restricted in his songwriting while in the band. Among his most famous songs were 'My Sweet Lord', 'What Is Life', 'When We Was Fab', and his cover of 'Got My Mind Set On You'. His biggest album was his 1970 debut 'All Things Must Pass'. He also wrote the Beatles classics 'Something', 'When My Guitar Gently Weeps' and 'Here Comes the Sun'. George was perhaps the first rockstar to stage a concert full of rock stars for charity. After his friend, Ravi Shankar, told him about the plight of Bangladeshi refugees, he felt compelled to help. He collected the likes of Eric Clapton, Bob Dylan, Ringo Starr, Billy Preston, Badfinger, and Leon Russell to play two sold-out in 1971. He then arranged for the release of a concert album and film, raising over $12 million by 1985. 8. George Harrison and Hinduism - what faith did George Harrison follow? By the mid-1960s, George was an admirer of Indian culture, and introduced it to the other Beatles. During the filming of 'Help! ', they met the founder of Sivananda Yoga, Swami Vishnu-devananda. Between the end of the last Beatles tour in 1966, and the beginning of the 'Sgt Pepper' recording, he made a pilgrimage to India with his wife Pattie. Harrison embraced the Hare Krishna tradition, and became a lifelong follower. EMI Films, 'Life of Brian'’s original backer, withdrew funding for the Monty Python film just before shooting began, due to the controversial religious subject matter. George, a big fan and friend, set up his own production company - Handmade Films - to fund the project. "Because I liked the script and I wanted to see the movie,” he said. He also appeared in it, as Mr Papadopolous. His company also financed 'Withnail & I', 'The Long Good Friday' and others.